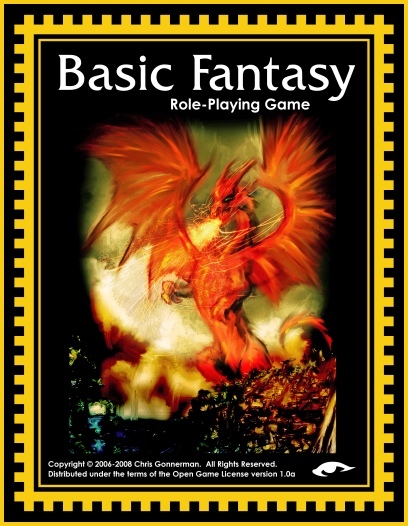 Basic Fantasy Role-Playing Game, or BFRPG for short, is one of the oldest retro-clones around (the core rules are copyright 2006). It doesn’t get as much attention as some of the other big-name clones, but I think this is due to it being a non-commercial effort, and is certainly not due to any failings as a game. The rules and all supplements and many adventures are open source and available free of charge in PDF and open document format on the BFRPG downloads page. At-cost print copies of the rules and some selected adventures are available from Amazon or Lulu (edit to add, BFRPG is now available through RPGNow). They are continually improved and released by Chris Gonnerman, the creator, and the greater BFRPG community, with pains taken to preserve backwards compatibility. This generally means errata but no major changes to rules or organization. The effort shows – the rules are clean and easy to understand, with little ambiguity, yet the complete core rules weigh in at only about 150 pages. The Basic Fantasy Role-Playing Game is a rules-light game system based on the d20 SRD v3.5, but heavily rewritten with inspiration from early role-playing game systems. It is intended for those who are fans of “old- school” game mechanics. Ascending armor class is used. Race-as-class is gone, and multi-class PCs (called combination classes) are handled simply by requiring the combined XP of both classes for level gains, and allowing the PC to choose the better of either classes’ attack bonuses and saving throws. There are no non-human level limits, there is instead a flat 10% XP bonus that is only available to humans (this is a unique difference from old school systems that don’t use race-as-class, like OD&D and AD&D). Bonuses or penalties for ability scores are standardized into one table. Gold is not directly transferable to XP, although there is an optional rule suggesting that the players spend gold to earn XP. Initiative is individual, not group, and modified by a PCs DEX bonus/penalty. There are comprehensive subdual and wrestling rules. There is no standard alignment system (although one is available as a supplement). I think almost all of these are improvements, particularly getting rid of both level limits and race-as-class, although opinions will of course vary, and most of these are easily house-ruled, as in any old-school system. The big four classes (Fighter, Magic-User, Cleric, Thief) and standard races (Human, Elf, Dwarf, Halfling) are covered in the core rules, while many more are available from the supplements section of the downloads page, along with character sheets, GM aids, and additional rules. If you wanted a more AD&D 1e-style game, for example, the Assassin, Ranger, Paladin, Druid and Illusionist are available as supplements, along with the races Half-Elf, Gnome and Half-Orc. There are also more uncommon classes like Pyromancers, Bards, Barbarians and lots of others. One could spend days going through all of the freely available material. The artwork has a great, old-school feel to it, and the fonts are a very close match to the ones in the Moldvay Basic rules. If you are a new gamer or need to introduce neophytes to tabletop roleplaying, the rules are simple and well presented, there are a few introductory adventures available, and there is a nine page beginner’s essentials supplement that can be printed or referenced from a tablet. It will also appeal to experienced gamers and DMs, given the large community around BFRPG and the huge amount of supplementary material one could easily run any style of campaign they liked. I’m looking forward to running a BFRPG game myself. Hey, thanks for the kind words! I’d like to point out that the BFRPG Core Rules are now available on RPGNow, in both paperback and hardback. Also, we’ll be releasing the 3rd Edition Core Rules and the newly-completed Basic Fantasy Field Guide in print before Black Friday 2014! Unfortunately, due to the excruciating slowness of the RPGNow system, the new books may not be available on RPGNow quite that quickly, but we’re on track to deliver on that schedule via Lulu.com and CreateSpace.com/Amazon.com. Again, thanks for the kind words! Hi Chris, you’re welcome, and I updated the post with a link to RPGNow. Thanks for your ongoing hard work!